Q When is cataract surgery considered complex? A There are several ways. A complex cataract surgery may be performed on a patient with pupils that do not dilate because of chronic parasympathomimetic drug use, scarring or trauma. In such cases, mechanical dilation of the pupil is necessary to enable the surgeon to extract the cataract and place an IOL. Also, complex cataract surgery occurs when the surgeon is required to suture the haptics of an IOL, or implant a capsular tension ring. Pediatric cataract surgery with an IOL almost always involves primary posterior capsulo-rhexis which is defined as complex cataract surgery in the CPT description. CPT 66982 is judged on a case-by-case basis and may require an operative report to support your claim. Q Must complex cataract surgery be preplanned? A No. There are intraoperative surprises that may require techniques that are best described as complex cataract surgery. Q What types of cataract surgery should not be considered complex? A Cases that require more time than usual are not necessarily complex. For example, a case may be longer if the lens requires more phaco time. Also, some cases require unplanned anterior vitrectomy for surgical misadventures. The vitrectomy is bundled with cataract surgery under Medicare’s NCCI edits and does not, by itself, render the case complex. The use of a femtosecond laser in laser-assisted cataract surgery is atypical, however it is not, by itself, complex cataract surgery because it represents a variation in surgical instrumentation to perform a capsulorrhexis and lens fragmentation, both elements of routine cataract surgery. In addition, the implantation of a presbyopia-correcting or astigmatism-correcting IOL does not qualify as complex surgery per se. In March 2016, CPT Assistant1 published that “the additional work of instilling and removing Trypan Blue dye from the anterior segment though an additional surgical step does not reach the threshold of physician time, work, or intensity necessary to report the complex cataract code”. If specifically stated in their local policy, a payer may allow the non-routine use of dye in dense, mature, or hypermature cataracts as complex surgery. At this time, only five Medicare Administrative Contractors (MACs) allow this: Novitas Solutions,2 Palmetto GBA,3 CGS Administrators,4 National Government Services (NGS),5 and Noridian Healthcare Solutions.6 Without specific instructions to the contrary, the CPT Assistant guidance should be followed. While there are many subtle variations in cataract surgical technique, they usually fall within conventional routine cataract surgery. Q Does use of Iantech’s miLoop™ qualify as complex cataract surgery? A No. The miLoop device is a small nitinol snare activated by a thumb deployment that chops the lens. Fragmenting the crystalline lens is one step in routine cataract surgery to facilitate lens removal with phacoemulsification. The miLoop may be useful in routine and complex cases to facilitate endocapsular nucleus disassembly, capsular stabilization, and cortical release during the procedure. 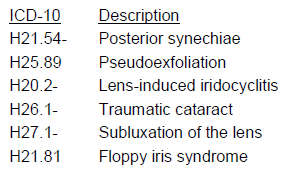 Q What diagnosis codes may support complex cataract surgery? By themselves, these diagnoses are insufficient to report complex cataract surgery. The operative report must describe the atypical devices or techniques used such as iris expansion device, suture support for intraocular lens, or primary posterior capsulorrhexis. Check with your MAC for a complete list of ICD-10 codes. Q Is 66982 subject to Medi-care’s NCCI edits? A Yes. Current NCCI edits are largely the same as those for 66984. Q Is 66982 eligible for HOPD and ASC reimbursement? A Yes. The 2017 HOPD facility payment for 66982 is $1,824, and the ASC payment is $997. These are the same facility payment rates as for conventional cataract surgery with IOL. Q How frequently is 66982 used? A Of all Part B Medicare claims paid during 2016, complex cataract surgery is about 9% of all cataract extractions with implantation of an IOL. Surgeon utilization rates vary; some may perform complex cataract surgery more than others. 1 CPT Assistant is a subscription publication of the American Medical Association. Link here. 2 Novitas. LCD L35091. Cataract Extraction (including Complex Cataract Surgery). Rev eff 08/10/17. Accessed 09/28/17. 3 Palmetto GBA. Local Coverage Article A53047. Complex Cataract Surgery: Appropriate Use and Documentation. Rev eff 05/11/17. Accessed 09/28/17. 4 CGS Administrators. LCD L33954. Cataract Extraction. Rev eff 10/01/16. Accessed 09/28/17. 5 National Government Services. LCD L33558. Cataract Extraction. Rev eff 11/01/16. Accessed 09/28/17. 6 Noridian Healthcare Solutions. LCD L37027. Cataract Surgery in Adults. Rev eff 10/10/17. Accessed 10/17/17.